The rumour mill has been working over time today with chatter that Forgeworld will be releasing a Horus Heresy supplement in the coming year or so. This is of no surprise to me at all. If anything I’m a little surprised it’s taken them this long to do it. But the clues were there with all the power armour and pre-heresy tank variants coming out. There’s also rumours of a supplement that, basically, is the early years of the 42nd millennium. The Emperor is dead, and his body is in the hands of the Ultramarines. The Imperiuam has been torn asunder and is now a group smaller empires controlled by the Astartes who are at war with one another. Needless to say the Ultramarines and their successors control the biggest chunk of space. Terra is in the hand of the Imperial Fists and believe the Emperor’s body needs to be laid to rest so he may be reborn. The rumours prattle on at length but the point is that the supplement, if it ever comes to light, would take 40k from 5 to midnight to about quarter past. The commercial sense is clear as the majority of players have Space Marine armies and therefore a high percentage of games are Marine vs Marine and it’s just a ‘training exercise’. This would allow players to legitimately play one another. Anyway, I wonder how the Heresy supplement will tie in to the books. I’d like to think there’ll be rules for Primarchs and, therefore, models. But more importantly a balance needs to be found between what the Astartes were and what they become, especially in respect of the traitor legions. I’m a little apprehensive if I’m honest as the Horus Heresy novels are doing a fine job of fleshing out the events. An IA book, if allowed to, could run roughshod over everything Dan Abneet, Graham McNeill and the others have cultivated. The talk of the Horus Heresy supplement got me thinking about, once more, the fluff. Specifically about the Space Wolves as I think they’re probably one of the hardest Legions to capture in game and more so for Warhammer 30,000 (as it’ll inevitably be dubbed) – the chapter of the 41st millennium being fairly different from their Heresy incarnation. More than that I started thinking about the Space Wolves and their relationship with the Emperor. We know that the Space Wolves were the Emperor’s executioners. His attack dogs. It’s also fair to assume that the other Legions were aware of the the secondary role the Space Wolves had beyond prosecuting the Emperor’s Great Crusade. But the question I’m throwing out there is what was the extent that the Primarchs and the other Legions aware? Did they believe that the Space Wolves were given the task because they were eager to please savages or because they knew the strength that the Space Wolves possess. Those that had read the Horus Heresy novels will know that the Wolves were unleashed on three separate occasions. Once against each of the lost legions, the third time against the Thousand Sons obviously to great effect. The thing that has always made the Space Wolves more dangerous than the World Eaters was their self control. Their savagery in combat was always tempered by strategy and an awareness of the violence they unleash. It’s almost a grudging acceptance of their savagery. They see a problem and their mind immediately leaps to the most expedient way of dealing with it. Such as throwing a space station at planet. It’s brutal, mind bendingly violent but the undertone of logic is what makes them so terrifying. Whereas the World Eaters would and did descend into mindless slaughter. The World Eaters were content to wreak havoc for havocs sake. To butcher all before them because they liked it. The Space Wolves were designed to be able to take on any of their brother legions. They’re psychically resistant, their ferocity and lupine heritage makes them difficult to scare and even hard to put down. Their tactics are uncompromising and unpredictable and their savagery tempered by reason and cold logic. It is a terrifying cocktail of traits. And makes me ask the question; to what extent was Leman Russ truly a brother to the other Primarchs? All the other Primarchs possess obvious facets of the Emperor’s personality. Some even share traits. Roboute Guilliman, it is said, was almost a straight up clone. I’ve always thought that Leman Russ possessed the animal, bestial nature of the Emperor that lurks within all of us. But the more I’ve thought about it the less I’m sure. Considering the task that the Emperor had in mind when he created Leman Russ and the Space Wolves it would make far more sense for Leman Russ to not share the same familial bonds to make his task that much easier. His loyalty had to be, first and foremost to the Emperor. It makes me wonder what the Emperor had in mind for the Space Wolves after the Great Crusade. Or all the Legions for that matter. It makes me suspect that the Emperor intended for the Space Wolves to be a galactic patrol force. A force brutal enough that it would quell insurrection and keep the other Legions in line. However the far more likely thought is that the Emperor created the Space Wolves because he always suspected something could go wrong, whatever that may be. The Space Wolves were an insurance policy, for want of a better term. But it all comes back to that decisive moment when the Primarchs were scattered denying the Emperor the chance to nurture the Primarchs into what he needed them to be. But I suspect that Leman Russ was created exactly as he was intended to be. He was the Emperor’s greatest creation and most devastating weapon. It occurs to me of all the loyalist Legions the Space Wolves would have been most feared by the traitors. As not only were they the most capable to bring the fight to the traitors but they already had experience of doing just that. They would have also been fired by a righteous indignation that the Emperor was defied, rather than the hurt of a brothers betrayed. The funny thing is that the Primarchs spend an awful lot of time not trusting the Space Wolves because of their tribal nature, unkempt appearance and savagery in combat, but of all of the Emperor’s creations they were the only ones that ever acted with wholeheartedly the Imperium’s best interests in mind, the Emperor’s fullest support and his unwavering approval. For all the power games, manipulations and rivalries that went on amongst the other Primarchs, Leman Russ was the most trusted and equally the most loyal of all the Emperor’s sons. This despite Leman Russ never seeking it out or even acknowledging it. If anything I rather feel that Leman Russ, incorrectly, believed the Emperor tolerated him in the same way a father tolerates a dog bought to keep the children safe. A necessity rather than something to be loved. I suspect the opposite to be true. He loved Leman Russ precisely because he was the immovable rock beneath his feet. He knew that Russ would do what he could not – to protect his children and his subjects, even from themselves, no matter the cost. It would be very interesting to learn if there was ever a Lodge in the Legion. From what I understand, the theory goes that each of the original Legions had the Warrior Lodges from which the Heresy found its roots. That the Wolves had a Lodge is never mentioned – to my knowledge – but given how insular the Legion was as a whole, I don’t believe it possible. Russ was just about as pragmatic as it was possible for a Primarch to be. He accepted the role handed down by the Emperor without question. There’s that interesting little scene toward the end of Prospero Burns where Russ is addressing the Thousand Sons through their connection with Hawser. Russ is giving Magnus one last chance to end the slaughter of what is coming before it even starts. Whatever else is thought about the Rout, they are all about brotherhood. Russ didn’t want to have to sanction his brother – but he would if he had to. It’s no different to the Chaplains of the Chapters in 40K. They will save you from yourself, even if it means you die. In that way, Russ was loyal to all the Primarchs. Given the hubris that goes with being a Space Marine, I have my doubts that the other Legions feared the Space Wolves. They may not have trusted them, or Hell even liked them that much. Part of what made the Wolves as dangerous as they were was that they simply didn’t care. 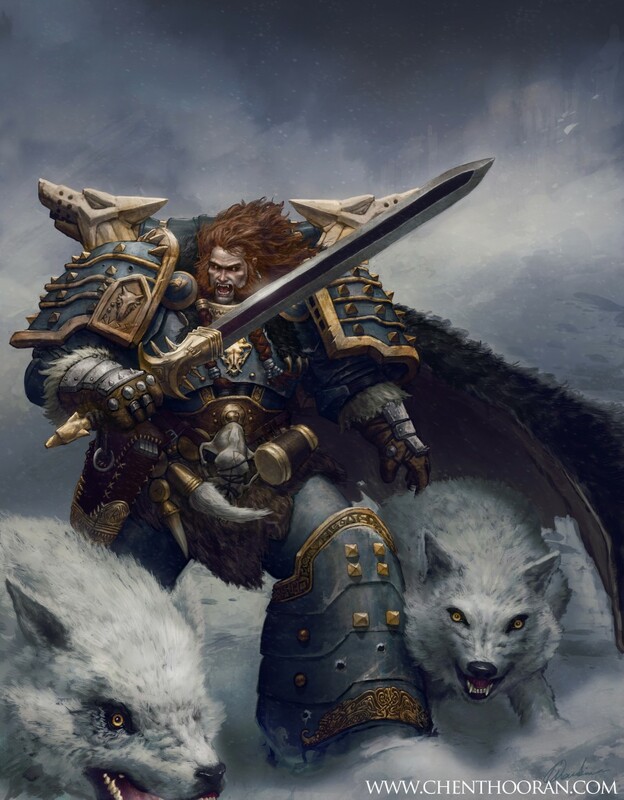 Iv’e bin reading threw a lot of sites and forums about the space wolves and what is writing above is the perfect view of the space wolfs for my part, i didn’t disagree once in you’re text, you’ve given me a lot of new things to think about the space wolves.